In October 2014, the fourth edition of the RA Trend Study was published, with a time horizon of 2025. The study was updated in November 2016 to include the data from the RA 2016 survey. 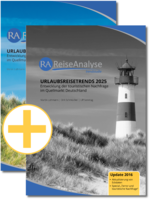 The updated RA Trend Study 2025 has 52 pages and 21 figures.